Shoppers are entering a brave new world of retail technology that they could find appealing -- or annoying. Stores hope to catch customers' attention and improve the buying experience with interactive devices such as holographic store greeters and mirrors that dispense fashion advice. While these technologies may be eye catching, consumers could find them gimmicky, even irritating. "The more technology, the more you must compensate for it with a human touch," says Patricia Aburdene, author of Megatrends 2010: The Rise of Conscious Capitalism (Hampton Roads Publishing, 2010). "Technology for its own sake [can be] technology overkill. High tech/high touch is an exquisite balance of technology in service to the human experience of sensuality." Louis Rosas-Guyon, president of R-Squared Computing, a business technology consulting company, and author of Nearly Free IT for Micro and Small Business (Heroic Cow Publishing, 2009), judges the merits of retail technology on five criteria: convenience, speed, accessibility, advertising-free information and soft selling. "My ideal shopping experience is like a caveman hunting: find my prey, acquire/kill it, and then take it home hanging from my spear, singing songs of victory," he says. "Any technology that helps me be more efficient when I shop is a winner in my book." If you walk by Eye See Solutions in the vision-care area at the Wal-Mart store in Plant City, Fla., you may see a small crowd gathered around a "virtual woman" talking about why you should get an eye exam. This holographic greeter takes the place of an employee at a lower cost, says Dale Gillis, co-owner of Mooresville, N.C.-based Marketing Ad Group, which began promoting the product last summer and has leased about 70 greeters. "You might have to pay someone $10 an hour to be a greeter, while this costs just $2 to $3" an hour based on the monthly leasing cost. Alice Marie Bruce, office manager for Eye See Solutions, an optometry practice that rents space in Wal-Mart, says the Plant City store has seen an increase of about 50 percent for eye exams and almost 60 percent for product sales since installing the virtual greeter in November. "The greeter offers various discounts on products and services through a QR code she displays," Bruce says. "We can directly attribute these increases to the discounts generated by the scanned QR codes." Expert opinions: Rosas-Guyon doesn't foresee long-term success for the holographic greeter. "Ultimately, we are social animals," he says. "Human interaction is still too important." Aburdene agrees that short-term cost savings aren't worth the loss of human interaction. "Greeters are supposed to provide the human touch," she says. "That's something technology can't do -- ever." Interactive mirrors offer product suggestions and style advice. Most retailers can't afford their own style advisors, but Winston Salem, N.C.-based Mirrus has created an interactive mirror that can help customers make fashion choices and generate additional sales. Shoppers either hold up or try on an outfit, then step in front of the mirror, which displays recommended accessories and their location in the store. "Retailers today have to work so hard to get people into the store. This provides a way to keep them there and move them from one department to the next," says Mirrus founder and CEO Brian Reid, whose company began marketing full-length and countertop mirrors in 2010. When shoppers aren't using the mirrors, retailers can play videos on such topics as the right way to wear a scarf or the style of sunglasses that best suits different face shapes. Mirrus currently has about 3,000 mirror units installed in clothing stores, sports and entertainment venues, airports and beauty salons around the world. For example, the Paul Mitchell Beauty & Cosmetology School in Charlotte, N.C., which sells hair products and discount haircuts, is testing mirrors that advertise product specials and provide reminders to book an appointment. Reid wouldn't comment on the mirror's cost, but he said he tries to "create a financial structure that enables [the business] to recoup the hardware investment in eight months or less." Expert opinions: Rosas-Guyon says to expect this technology to be adopted quickly by large department stores because it can encourage additional sales. But Aburdene believes the mirrors might be invasive: "The customer is standing in front of a mirror partially dressed and feeling vulnerable, and some hidden force is telling her to buy something? What else can this computer see about me? It's not great for retailers if it's not great for customers." 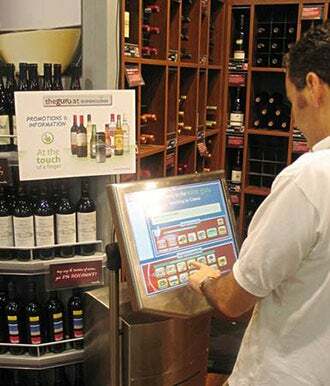 Touchscreens like the Wine Guru let shoppers compare products. Touchscreens are a growing part of the shopping experience, and they're becoming more sophisticated. 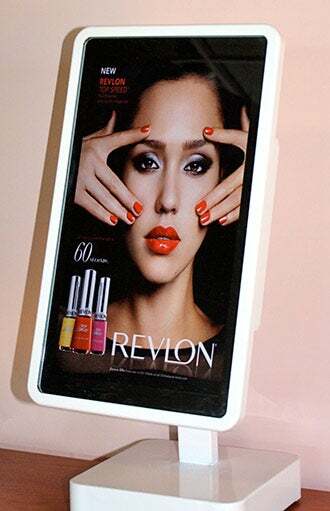 Touchpoint Interactive Media of Dublin, Ireland, for instance, is selling multi-touch technology that brings together many products on one screen so shoppers can compare features. Last year, Vodafone began using Touchpoint's screens to let customers compare features of various mobile phones in 55 stores across Ireland. "Overall feedback has been very positive," says Alessandro Quadu, retail operations executive for Vodafone Retail Ireland. "Walking the customer through the process step by step using the screens is a much more interactive experience and allows a much better profiling experience." Another offering from Touchpoint: the Wine Guru, a virtual wine expert managed by a backend master database that provides information about a store's selection and costs $40 to $120 a month, depending on the size of the inventory and the bundle of hardware and software used. Expert opinions: Rosas-Guyon is on the fence, saying such touch screens would work best in auto dealerships and other places where buyers need to review large amounts of information before making a decision. But, he adds, "More often than not, when confronted with too much information, humans delay decision making in order to review the facts." Aburdene is a big fan of the Wine Guru because it provides information many consumers want. "Wine is already a high touch experience, and wine drinkers are technology consumers," she says, "so this technology is a cost effective balance of high tech/high touch."